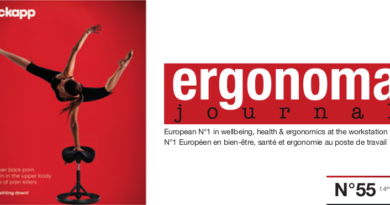 This new issue of Ergonoma Journal, will allow you to read over the pages, some reports, how much industry 4.0 takes more and more a larger place. But what is reassuring is that in fact it is marked by an interactivity and an increased independence between the MAN and the machine. On the one hand, man needs the machine to decode and manage «heaps» of information captured through digital and on the other the machine needs the human to bring it the reflection, the necessary flexibility for good decision-making. It also states that, because of the need for «good health» at work, robotics replaces and assists employees in difficult jobs, which is a good thing. New professions will emerge for humans. New resources too. But are we ready? Are the education and training system really ready? For 30 years or more, in Europe, politicians have postponed these deadlines not by ignorance of these new sciences, but because their only concern is the «game of elections», to be elected and re-elected! , while to put us in tune with these technologies of today and future, we have fallen behind and this delay in knowledge generates the fear of the robot. In fact, it is not the robot the enemy . The enemy is us with our voting ballots. The robot sends us back the face of our contradictions. Do not panic, learn to think, companies have finally understood, productivity, efficiency only work with well being, reflection, calm and recognition. So come to the Workspace Expo in Paris and discover today’s work environments where humans have the central place.